Spanish Chicken and Rice Casserole is a wonderful way to stretch a chicken. You can purchase either a whole chicken, or cut this chicken into pieces, so this Spanish Chicken and Casserole is very economical to make. This casserole takes very little time to put together, and it cooks in the oven all by itself. Do you like recipes that take minutes to put together, and then can be cooked effortlessly? If so, you are going to find this recipe perfect. Did I mention this recipe is very economical to make? 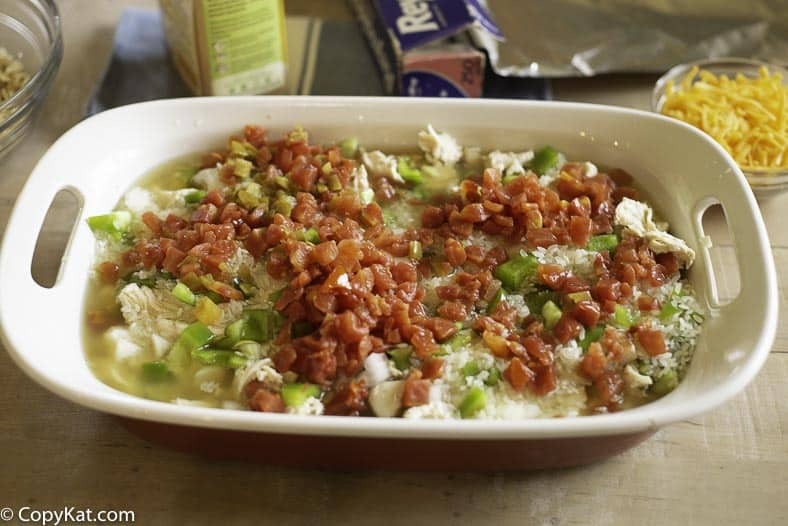 This Easy Spanish Chicken and Rice Casserole is a great way to use up left-over cooked chicken. 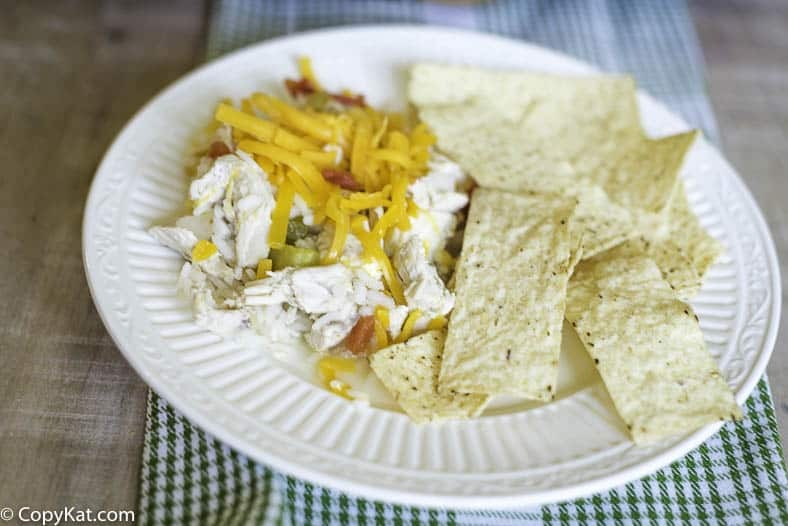 Cooked chicken is prepared with chicken stock, bell peppers, Rotel tomatoes, onions, and this casserole can be topped with cheese, and served with corn chips. It’s a great way to use up a leftover Rotisserie chicken. Cooked chicken is placed in the bottom of a 9×13-inch baking dish. 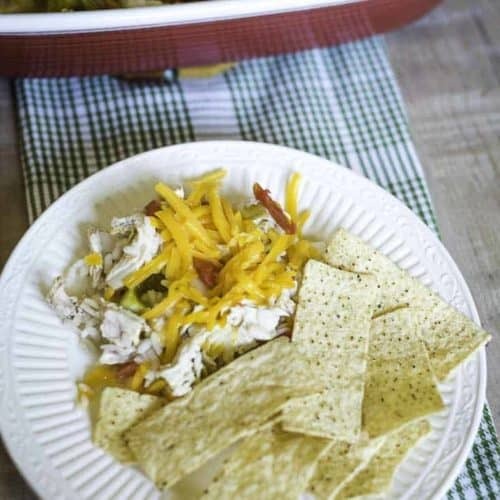 The chicken is topped with chopped onions and chopped green bell peppers. A can of Rotel tomatoes, uncooked rice, and chicken stock is added to the casserole. You will need to wrap the casserole dish well with foil and bake in the oven. The casserole should be baked for about 1 an hour. When you pull the casserole out of the oven, you can top with Cheddar cheese if desired. 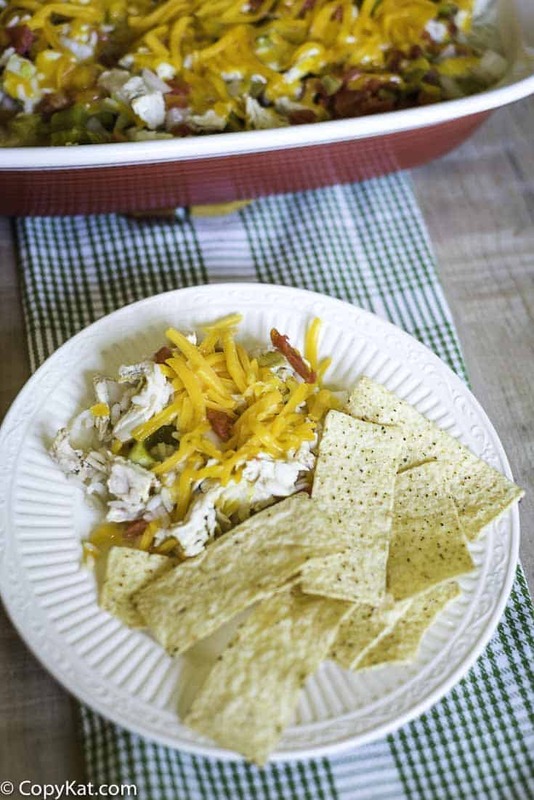 A sprinkling of Cheddar cheese adds a lot of flavor to this comfort dish. 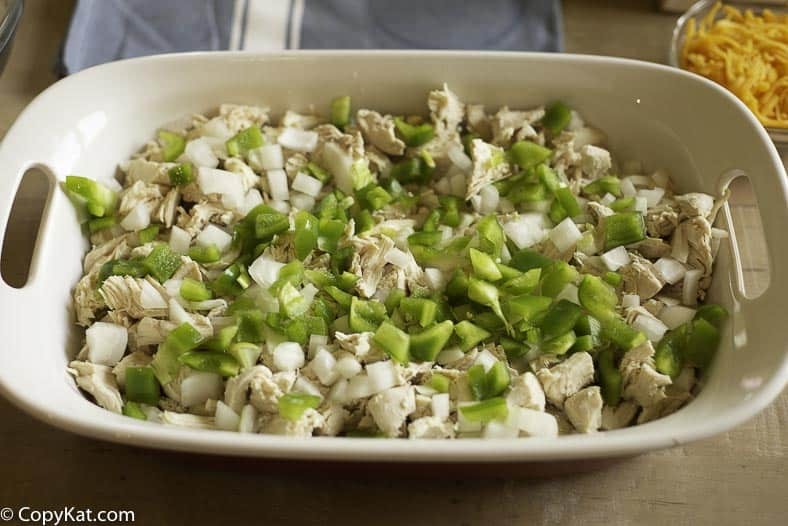 If you are looking for a recipe that will help you use up cooked chicken, and is a tasty way to prepare an economic chicken casserole, this recipe if for you! Love chicken casseroles? 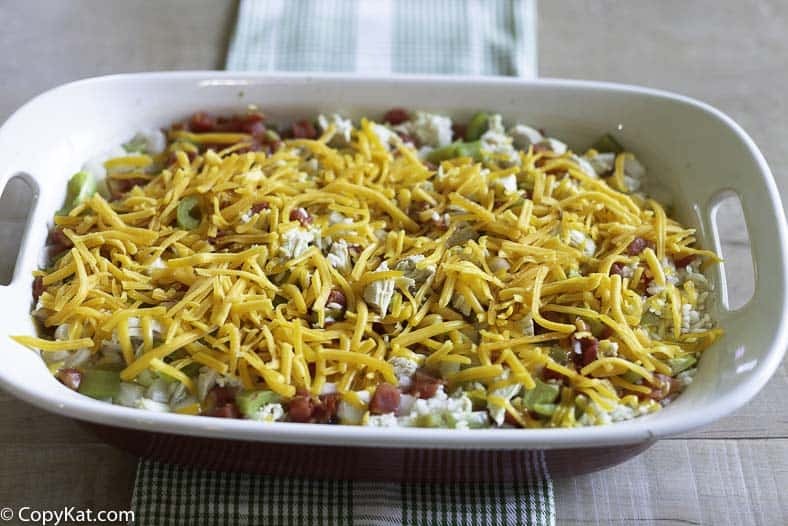 Be sure to check out these casserole ideas! This Spanish chicken casserole has some spice with Rotel tomatoes. Cut up chicken, place in a large pot and cover with water, add salt; bring to a boil reduce heat and cook for 45 minutes. Once chicken is cooked remove from the pot, let cool. Remove the chicken from the bone, cut into bite size pieces. 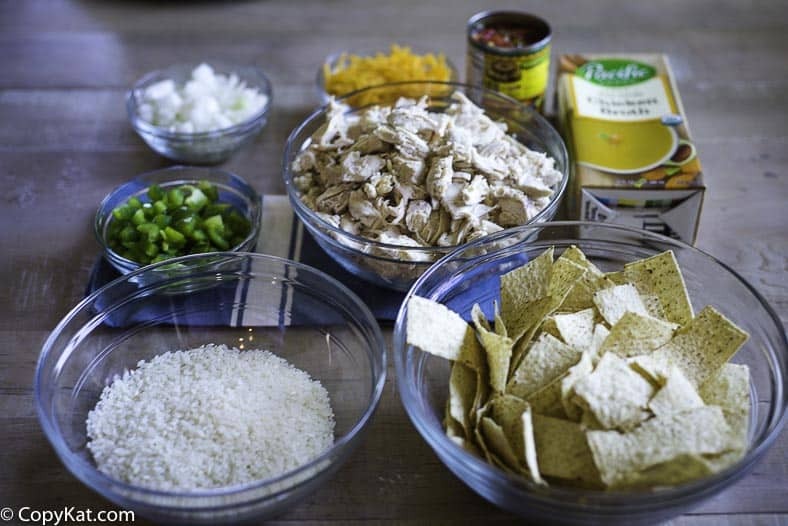 Spread the chicken on the bottom of a casserole dish; add chopped onion, green pepper and the uncooked rice. Pour the Rotel tomatoes over this then add the chicken broth. More broth may be added while cooking if needed. Top with cheese when cooked, return to oven until cheese is melted. Serve with the chips.